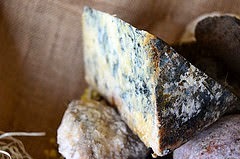 This blue cheese is lightly smoked before placed in caves to mature naturally. It is one of the most popular Spanish cheeses. 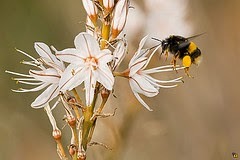 It is named after gamón, the common name in Spanish for asphodel, an herb of the lily family baring small white or yellow flowers that is abundant in the regions where the cheese is made in El Cornión Mountains in the western part of Picos de Europa, Asturias. During spring and summer, nomadic livestock graze in the pastures of these highlands. The cheese is made only when the herds are in these mountains, i.e. from May through September. Unlike most other blue cheeses except cabrales cheese, this is made from a mixture of the morning and evening milking’s of cows, ewes and goats. The measurements do not depend on cups, but the yield of the animals. 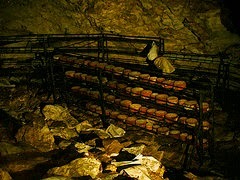 The next morning as much whey as possible is removed from the curds produced from acid coagulation. The whey is expelled after pressing for several consecutive days. Coarse salt is then sprinkled on the cheeses and they are left for two to three weeks on wooden racks to air and absorb the smoke from ash trees inside the hut where the herdsmen live. During this time the cheeses acquire a toasted chestnut color. Then they are taken the natural eaves or caves in the mountainside facing north and having a constant temperature of 12-15° C and 90-95% humidity for two months. Here Penicillium roqueforti, the principal agent for maturing, takes over until the rind has developed a thick coat of variegated grayish-greenish-reddish moldy down. Fascinating. You have a great blog. Thank you so much for sharing.